Rajasthan 1st Grade Teachers Exam 2014 : Rajasthan Public Service Commission (RPSC), Ajmer has uploaded the date sheet / time table for Rajasthan 1st Grade Exam Date, RPSC School Lecturer Exam on 9th May 2014 that exams will starts from 12th July to 20th july 2014. Now once again on 20th June 2014 RPSC, Ajmer finally conferm the date of Rajasthan 1st Grade Exam / RPSC School Lecturer Exam with News flash on its official website www. 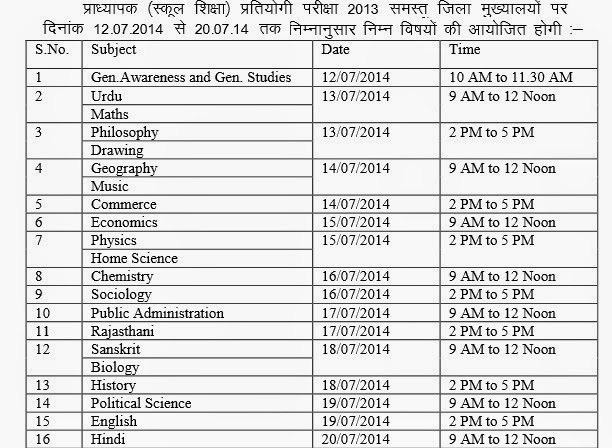 rpsc.rajasthan.gov.in which mentioned "School Lecturer Exam 2013 has already been scheduled from 12.7.2014. Please refer Press Note dated 9.5.2014 for details on rpsc.rajasthan.gov.in"